The Clarins skincare system provides some of the best beauty and salon skincare treatments on the market. They have been a leading skincare brand for over forty years and it is this experience that makes it one of the most popular designer, male and female skincare, cosmetics and fragrance brands. All products are plant-based providing natural and gentle care for your skin. The Clarins skincare system is designed to help keep skin looking youthful and more radiant. Delighted to get this product at such a reasonable price,easy to order and prompt delivery,will definitely recommend this site to my friends..
this normally costs £22.50 in department stores so to find it for £16.50 is a great saving for a great product. Highly recommended. 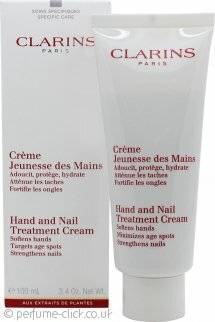 Clarins handcream is the best there is keeping hands soft and smooth no matter how rough they are. Excellent service too. Thank you. Cannot live without this hand and nail treatment cream. I am amazed to be able to purchase this in a 200 ml tube. Great value for money. Love this product. Have used it for years. Soaks into hands almost immediately. Wouldn't use any other hand cream. After years of artic exploring and sailing I've developed sun damage and "liver spots" and a little bit of frost nip. This is the best cream of all that I've tried for reducing the imperfections and liver spots.I strongly recommend this for men as well as women.